Forum has a poll out today, and it's bad news for the Liberals: instead of fighting the Tories for first place, they are fighting the NDP for second. The numbers in BC do look out-of-whack (campaign high of 41% for the NDP and near-low of 21% for the Liberals), but the poll does cast doubt on the narrative that this is now a two-horse race. Indeed, it sides with last week's EKOS in suggesting that the Tories may simply be running away with the election. Forum also confirms what Nanos is seeing in Québec: the NDP has stabilized around 30-35%. This is a good place for the NDP to stop its slide: the 10 points or so that it lost only cost it about 10 seats. The next 10 points might cost it 30 seats or more. 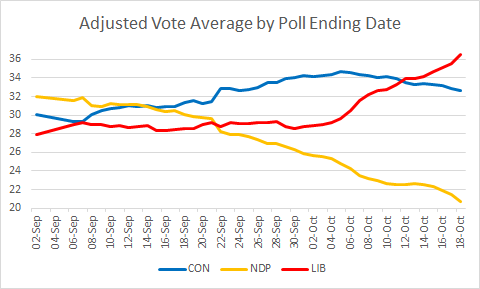 Nanos, however, still shows the NDP trailing the other parties. It has extreme numbers in BC in the other direction: the NDP is third there. 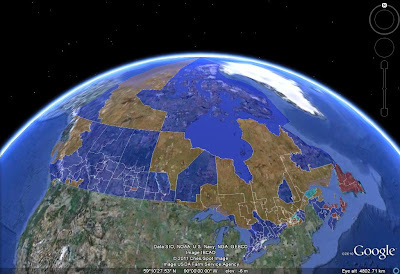 The Tories are at their pre-campaign goal of 10 seats in Québec, and are at a campaign high nationally. The Liberals are back where they were four weeks ago, with modest gains in Québec and the Atlantic offset by setbacks in Ontario. 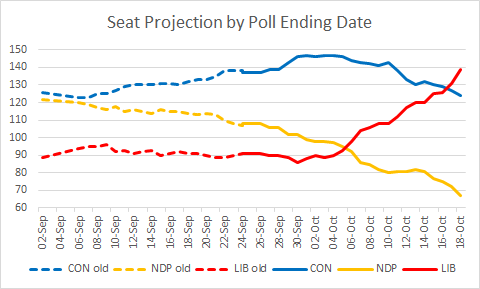 The NDP continues to be at a campaign low.